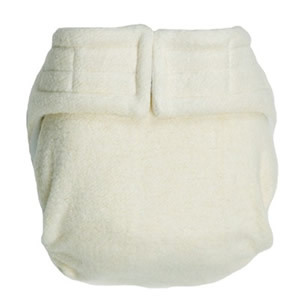 Manufactured by Happy Heinys, these pocket cloth diapers are made of 55% hemp and 45% cotton. Happy Hempys have elastic at the legs and back to allow for a snug yet comfortable fit. They are made with Aplix brand hook and loop closures which fit a wide range of babies and make for very fast diaper changes on wiggly little ones. 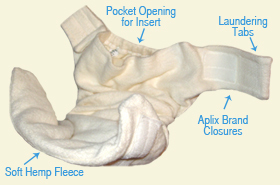 Pocket Diapers need to be stuffed with inserts, you decide just how much your baby needs. 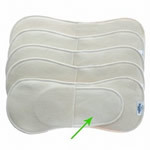 Joven also carries Happy Heinys Stuffins/Inserts which fit perfectly into these pocket cloth diapers. Stuffins feature a pocket design that allows you to add extra absorbency where your baby needs it without increasing the bulk of your pocket diaper. For boys, place the oval all the way to the front of the Stuffin. For girls, place the oval in the center. Finally, place your stuffin inside your pocket diaper. When used with the small oval insert (included) you will have 7 layers of hemp fleece in the desired wet zone for your child. You can use as many ovals as you need in the pocket for added protection in the wet zone without increasing bulk throughout the diaper. The more you wash these, the better they work.